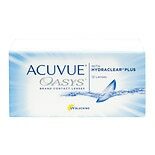 Acuvue Oasys are a brand of contact lenses designed to correct vision problems in people who have normal eyes or individuals who have astigmatism or presbyopia. These contact lenses are also designed to enhance the comfort of the wearer with special technology known as Hydraclear Plus. 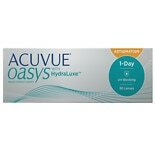 People who suffer from dry or tired eyes after wearing contact lenses for an extended period of time may find Acuvue Oasys contact lenses especially helpful. Like most contact lenses, they are made to help people with nearsightedness or farsightedness see much more clearly. Wearing contact lenses allows you to avoid depending on your glasses all the time. 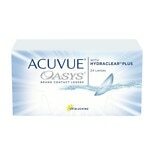 Acuvue Oasys lenses go a step further by maximizing your eyes' comfort with proprietary technology known as Hydraclear Plus. With this feature, you can wear your Acuvue contact lenses all day without your eyes feeling uncomfortable from lack of moisture, perfect for long days at work or school. You'll be able to experience clear, uninterrupted vision without relying on rewetting eye drops and other measures. People with eye conditions like astigmatism and presbyopia can also experience the comfort of Acuvue Oasys lenses. These specially designed contact lenses have additional features that correct your vision while accounting for the unique nature of these conditions. 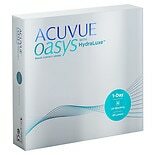 Acuvue Oasys for astigmatism and presbyopia also incorporate Hydraclear technology to help your eyes retain moisture and oxygen for a comfortable daily wearing experience. Oasys contact lenses designed for astigmatism use Accelerated Stabilization Design to keep lenses in the perfect position at all times, while Oasys lenses for presbyopia incorporate Stereo Precision Technology to keep your vision balanced in any lighting condition.